The two most common flea beetle species are striped (top) and crucifer (bottom). Key practice: Crucifer and striped flea beetles react differently to their environment and to seed treatments. It is important to monitor emerging canola seedlings to know what you’re up against. 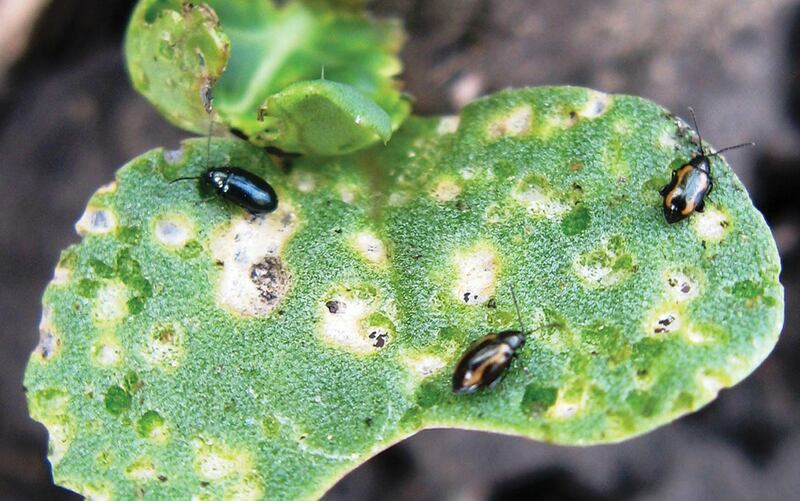 Flea beetles are chronically the most economically damaging insect pests of canola. Although the crucifer flea beetle remains the predominant species, this study shows the striped flea beetle to be expanding its range across Western Canada. As these two species respond very differently to their environment, spring scouting is critical to planning proper control strategies. Crucifer flea beetle (P. cruciferae) is most frequently found in the southern Prairies while striped flea beetle (P. striolata) is traditionally found in the Parkland Region of the northern Prairies and the Peace River Region of Alberta. A third species, the hop flea beetle, occurs across the Prairies in low numbers along with several other flea beetle species of minor importance to canola. This five-year Prairie-wide study was conducted to determine the number and distribution of the most common flea beetle species that canola growers will find in their fields. The project also investigated whether striped flea beetle numbers indicate a major shift in flea beetle species. 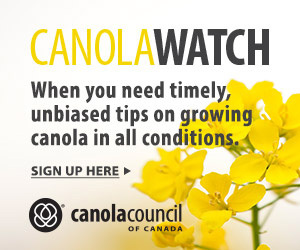 Earlier studies quantified the risk to canola from crucifer and striped species. As insecticidal seed treatments are the primary method of flea beetle management, results from Tansey et al. and Elliott concluded that control failures are more likely when populations of striped flea beetles outnumber crucifer flea beetles, because the striped species is less susceptible to these treatments. Principal investigator Julie Soroka conducted a preliminary survey in 2007 at 25 locations in the Canadian canola-growing region. This survey expanded to include 34, 44, 98 and 99 sites from 2008 to 2011, respectively, across the Prairies and in the U.S. state of North Dakota. Yellow sticky traps were placed in or near canola fields starting at the time of seedling emergence and for an average of three to four weeks in May and June. In total, 11,180 traps were retrieved from 300 sites. When compared to surveys conducted in the 1970s, the numbers of striped flea beetles in northern areas had increased dramatic-ally. The striped species is now the most frequently encountered flea beetle in the Peace River Region and central Alberta, central Saskatchewan and much of Manitoba. Striped flea beetle is also now found in increasing numbers across southern canola fields where it was once a very rare sight. Despite this shift in species frequency and the expanding range of P. striolata’s occurrence across the prairies, P. cruciferae remains the predominant species in those canola fields where flea beetle numbers are particularly high. Scout fields in the spring. Assess damage to cotyledons and the first true leaves of seedlings daily. Continue to scout until the seedlings are past susceptibility, especially when temperatures exceed 14°C. 25 percent defoliation to reduce yield loss, but only spray if flea beetles are still present and actively feeding. For crops with lower plant populations, the action threshold will be lower.